You can turn on the display by a simple wrist gesture or press the button on the side. Enter and browse through the menu by swiping the touch screen up or down. Select items by tapping the icons, and return with pressing the button on the side. Your daily activity goal is visualized in some of the watch faces and in the activity bar in My day menu. For example, you can see your progress towards the goal how the clock numbers fill up with color in one. For more information, see 24/7 Activity Tracking. Here you'll see the progress of your daily activity goal in more detail, steps, distance and calories and any training sessions you've done so far during the current day or any planned training sessions you've created in the Flow web service. Tap each event in your day to see the it in more detail. To see what you have left to go to reach your daily activity goal, tap the activity data. This is where you start your training sessions. Tap the icon to access the sport selection menu. You can edit the selection in the Flow web service to keep your favorite sports more easily accessible on your A360. Go to Flow, click your name and Sport profiles. Add or remove your favorite sports from there. To start training, wait for your heart rate to appear next to a sport icon and tap the sport icon and the training session begins. 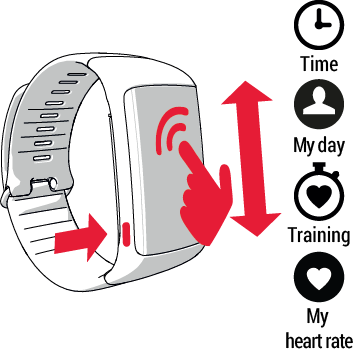 Here you can quickly check your current heart rate without starting a training session. Just tighten your wristband, tap the icon and you'll see your current heart rate in a moment. Press the side button to exit. In Favorites you'll find training sessions you have saved as favorites in the Flow web service. If you've not saved any favorites in Flow, this item is not in the A360 menu. For more information, see Favorites.